After enabling set mouse=a, text copied inside of Vim will not paste outside of Vim. Does anybody know of a way to fix this? Press shift while selecting with the mouse. This will make mouse selection behave as if mouse=a was not enabled. Note: this trick also applies to "middle button paste": if you want to paste in vim text that was selected outside, press shift while clicking the middle button. Just make sure that insert mode is activated when you do that (you may also want to :set paste to avoid unexpected effects). Use "+y. You shouldn’t be using the terminal’s copy command anyway, because that copies what the terminal sees instead of the actual content. And then highlight something with the mouse and press Control-C to copy it. 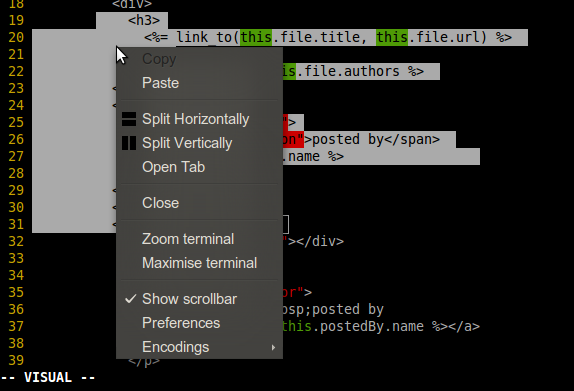 This feature only works when Vim has been compiled with the +xterm_clipboard option. Run vim --version to find out if it has. On OSX use fn instead of shift. In Ubuntu, it is possible to use the X-Term copy & paste bindings inside VIM (Ctrl-Shift-C & Ctrl-Shift-V) on text that has been hilighted using the Shift key. Another OSX-Mac option is to uncheck View->Allow Mouse Reporting (or press ⌘-R to toggle it.) This allows you to toggle between mouse interaction and mouse selecting, which might be useful when selecting and copy/pasting a few bits because you don't have to hold a modifier key to do it. I usually have line numbers enabled so this will also copy the line numbers if you select multiple lines. If you want to copy multiple lines without the line numbers disable the numbers with :set nonu and then you can :set nu to re-enable them after you're done copying. You can use :set mouse& in the vim command line to enable copy/paste of text selected using the mouse. You can then simply use the middle mouse button or shiftinsert to paste it. If you are using, Putty session, then it automatically copies selection. If we have used "set mouse=a" option in vim, selecting using Shift+Mouse drag selects the text automatically. Need to check in X-term. In ESC mode, when set mouse=a, select the text using mouse. This would enable the visual mode in vim. Then you can press 'y' to yank the selected text and 'p' to paste it wherever you want. This happens only within vim. Not the answer you're looking for? Browse other questions tagged vim configuration mouse copy-paste or ask your own question. How to clear the line number in Vim when copying? How to paste yanked text into Vim command line? How to copy paste from notepad to vim?